Picnics and barbecues can be lots of fun, however you can’t be too careful when handling and packaging food for cooking and eating outdoors. Summer heat increases the chance of bacterial growth in foods, and bacteria are more likely to grow in foods that are high in protein and moisture — meats, poultry, seafood, dairy products and egg dishes. Food poisoning cases double over the summer. Food poisoning is usually mild, and most people get better within a week. But sometimes it can be more severe, even deadly, so it’s important to take the risks seriously. Children, older people and those with weakened immune systems are particularly vulnerable to food poisoning. Undercooked meat – Raw or undercooked meat can contain germs that cause food poisoning, such as salmonella, E.coli and campylobacter. However, these germs can be killed by cooking meat until it is piping hot throughout. eating unwashed fruits and vegetables. Germs from raw meat can move easily onto your hands and then onto anything else you touch, including food that is cooked and ready to eat. This is called cross-contamination. Cross-contamination can happen if raw meat touches anything (including plates, cutlery, tongs and chopping boards) that then comes into contact with other food. Wash hands with soap and water before and after preparing food, especially raw meats. Everyone should wash hands before eating to prevent passing germs to food. If you don’t have running water at a picnic or campsite, set up a make-shift hand wash station using a water container with a spigot and wash with hand soap. As a last resort, waterless hand sanitizers or disposable hand wipes can be used. You don’t cross-contaminate. When cutting raw meats, be sure to keep their juices away from other food. After cutting raw meats always wash hands, cutting boards, knives, and counter tops with hot, soapy water. Sanitize cutting boards regularly and consider designating a special cutting board. Marinate foods in the refrigerator, not on the counter or outdoors. Don’t use the uncooked sauce that was used to marinate raw meat or poultry on cooked food. If you do want to use the leftover sauce, heat it until it comes to boil. Thaw frozen meat before grilling so it cooks evenly. Use the refrigerator for slow, safe thawing or thaw sealed packages in cold water. You can use the microwave, oven, or stove to thaw or partially cook the meat if it then goes immediately on the barbecue. Cook the meat to a safe internal temperature. Use a food thermometer to be sure. 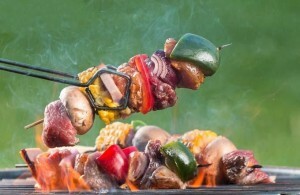 Place the food thermometer in the thickest part of the meat, avoiding bone, fat, or cartilage. Beef burgers: 160 degrees F.
Whole or ground chicken or other poultry: 165 degrees F.
Hot dogs, sausages: 165 degrees F.
Whole cuts (such as steaks, chops, ribs) of beef, pork, veal, and lamb: 145 degrees. Allow the meat to “rest” for 3 minutes before cutting or eating. Fish and shellfish: 145 degrees F.
Don’t assume that because meat is charred on the outside it will be cooked properly on the inside. Cut the meat at the thickest part and ensure none of it is pink on the inside. Some meat, such as steaks and joints of beef or lamb, can be served rare (not cooked in the middle) as long as the outside has been properly cooked. This will kill any bacteria that might be on the outside of the meat. However, food made from minced meat, such as sausages and burgers, must be cooked thoroughly all the way through. 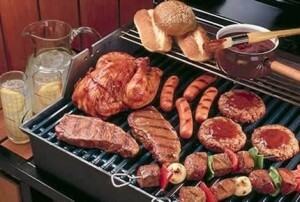 Turn the meat regularly and move it around the barbecue to cook it evenly. Don’t start to cook and then stop, intending to finish later, as bacteria grow faster in partially cooked food. Never place cooked food on a plate that previously held raw meat, poultry, seafood, or eggs. Be sure to have plenty of clean utensils and platters to avoid cross-contamination. Eat hot foods immediately and serve on clean plates. Bacteria grow rapidly at room temperature, so never leave food out for over 2 hours. If it a hot day no longer than 1 hour. It’s also important to keep some foods cool to prevent food poisoning germs multiplying. Don’t leave food out of the fridge for more than a couple of hours, and don’t leave food in the sun. Bring only the amount of food you think you’ll use. Consider taking non-perishable foods and snacks that don’t need to be kept refrigerated. Use an insulated cooler with plenty of ice or freezer packs placed around and on top of the food to keep it at 40 degrees F or below. Keep raw meat and poultry from contaminating cooked foods, or foods meant to be eaten raw such as fruits. Place raw meat and poultry in sealed containers or wrapped in plastic bags to prevent juices from getting on other foods. Fill the cooler up. 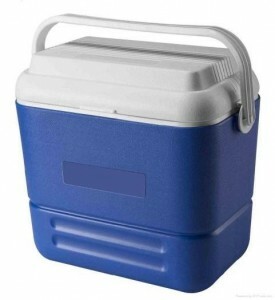 A full cooler will maintain its cold temperatures longer than one that is partially filled. Keep drinks in a separate cooler from the food. The beverage cooler will be opened frequently while the food cooler stays cold. If possible, transport the cooler in the air-conditioned part of your car, rather than in a hot trunk. Keep the cooler out of direct sunlight while traveling or at the picnic. Don’t let food sit out for more than two hours. On a hot don’t let food sit out for more than one hour. Bacteria can multiply quickly on food left out in warm weather. Store leftovers in a refrigerator or in a cooler with plenty of ice or frozen packs. Leftover meat, poultry, seafood, and egg products should be the first foods you want to keep cold. Salads and cut or cooked fruits and vegetables should be kept cold. Throw away perishable food that has been sitting out too long. If the ice or gel packs in the cooler have melted, and you can’t keep the food cold, throw the food out. Some foods such as breads, rolls, chips, crackers, and cookies are okay to leave out but should be covered for freshness. 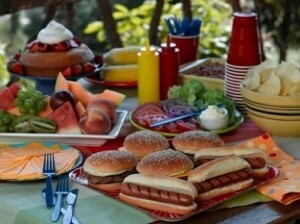 Condiments such as ketchup, mayonnaise, and mustard are acidic, so they are okay to leave out for a picnic or barbecue. Want To Supply Us ?